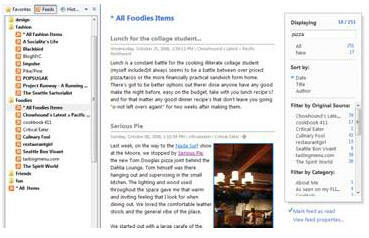 Feeds Plus is an Internet Explorer 7 add-on that makes your feed reading experience easy and efficient. You can read your feeds in a combined view (aggregate feeds) and get pop-up notifications when there are new items to read. This add on was developed by members of the IE RSS team at Microsoft. Note that Feeds Plus is not an official product and hence is not supported by Microsoft. Please note: FeedsPlus is not compatible with Internet Explorer 8. Feeds Plus is an unsupported tool. Tired of reading a feed at a time? Try reading them in a combined view. 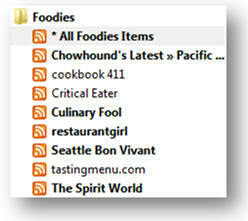 Feeds within a folder are grouped together as an aggregated feed so that you can quickly go through the recent updates. Also, you can continue to use the feed reading controls like search, sort, and filter on an aggregated feed. Want to see alerts for your favorite feeds? With Feeds Plus, you can set some or all your feeds to pop-up a notification when there's an update. Clicking on the notification opens the feed for you to read. The Feeds Plus tray icon will glimmer to show that there are new items available. The aggregated feeds generated by Feeds Plus are "fake feeds" added by Feeds Plus. If you use another application that synchronizes the Windows Common Feed List, the application will synchronize the feed, but will not be able to view the aggregated feed correctly. We recommend that you disable the aggregated feeds feature if you are using another application to read your feeds (right-click on the Feeds Plus icon on the system tray, select Settings and switch to the Aggregation tab. Clear the checkbox to disable aggregation. Feeds Plus pop-up notification does not provide support for screen readers. If you use a screen reader, we recommend that you turn off the option for notifications. Feeds Plus is only available in English at this time. Please leave feedback about Feeds Plus on the RSS Team Blog post.